Mastiffs are mammoth, symmetrically shaped dogs with powerful frames. They have large, square heads with broad, wrinkly foreheads and short black muzzles. Their small, brown eyes have a watchful but warm expression, and their dark V-shaped ears hang close to the cheek. They have thick, strong necks that slope down to deep chests and level backs. Their tapered tails are set high and hang low. They have short, thick coats that come in apricot, fawn, silver or brindle. Overall, Mastiffs carry themselves with dignity and poise. If you think Labrador Retrievers are too small, check out a Mastiff. Massive and sometimes lumbering, these dogs have a gentle, loving and dignified personality that makes them the quintessential “gentle giant.” Responsive and obedient, Mastiffs also have a quiet dignity and a serene intelligence that makes them seem almost mellow. Mastiffs rarely bark or make noise. When you come home, you’re likely to find yours stretched out on a bed or couch, their head perking up lazily to greet you. If you can get them off the couch, they’re always game for a roll on the carpet. Mastiffs have few equals when it comes to protecting the family. They have been used as guard dogs for thousands of years. However, Mastiffs are more likely to scare off an intruder with their intimidating size—they are not the types to make a fuss unless there’s a real threat. With some weighing almost 200 pounds, Mastiffs can be a handful to manage. Walking them, getting them in and out of cars can take a little extra time and muscle. You don’t necessarily need to be strong to manage a Mastiff—they obey commands and have a gentle way about them—but you need the time and patience (and space) to make them happy. Mastiffs will be fine living in apartments as long as they are walked regularly. Some can be slightly lazy, but it’s important to encourage them to get off the couch and go outside. Always keep them on a leash in public. 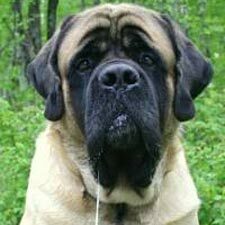 A healthy Mastiff can live as long as 12 years. Common health issues include hip dysplasia, elbow dysplasia, heart disease and eye problems. They are also prone to bloat, so feed them smaller meals throughout the day. Also, they tend to drool, so you may want to keep a few rags around the house. According to some accounts, Mastiffs (also known as Old English Mastiffs) were brought to England by Roman invaders thousands of years ago. Another theory is that Phoenician traders introduced them to Britain around the same time. Either way, Mastiffs have been bred in England for more than 2,000 years as exemplary sheepherders, guard dogs, police dogs and companions. Around the mid-1940s, the Old English Mastiff suffered a drop in popularity in England, but enthusiasts from America sustained the breed and helped re-establish their numbers around the world.